After seeing the first red band trailer for Nicolas Winding Refn's strange and violent Only God Forgives, we're excited just for the visuals alone. Reteaming with Ryan Gosling means everyone who loved Drive will give this film a chance, but they might not get exactly what they're hoping for, which is likely more of the same. Instead, this film seems even more bleak, stark and has a different style. Now a new teaser poster keys us into the madness we can expect as it doesn't use the face of Ryan Gosling. It's just a neon Chinese dragon face with the tagline "Time to meet the devil." Sounds ominous and looks awesome. Julian (Ryan Gosling) lives in exile in Bangkok where he runs a Thai boxing club as a front for the family’s drugs smuggling operation. When Julian’s brother Billy is killed their mother, Jenna (Kristen Scott Thomas), arrives in the city. She wants revenge and forces Julian to find the killer. Julian’s contacts in the criminal underworld lead him to The Angel of Vengeance, a retired police officer who knows everything and acts as both Judge and Punisher. Jenna demands that Julian kill The Angel of Vengeance, an act that will cost him dearly. 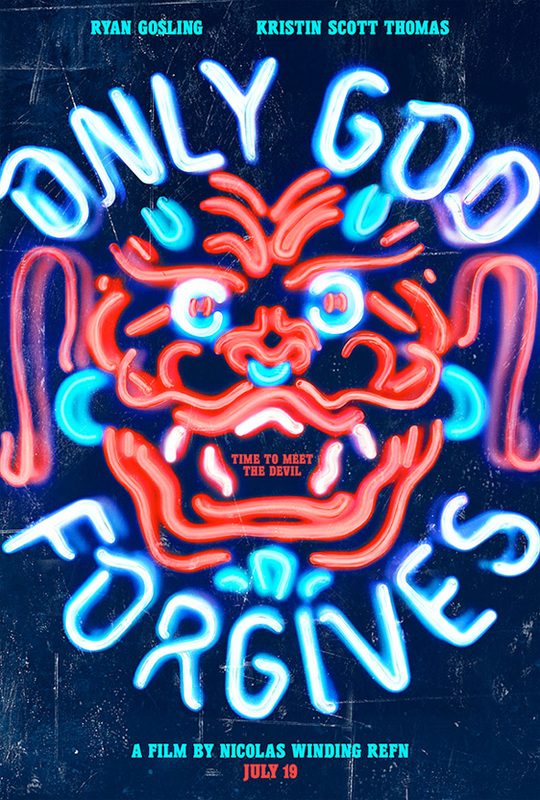 Nicolas Winding Refn writes and directs Only God Forgives, hitting theaters July 19th. the motion poster is definitely a bit inspired by Enter the Void title sequence.